Primary Inspired: Listening Center LINKY PARTY! While stalking exploring a bit last week, I found myself at Michelle Oakes' class website, Fantastic First Grade, and discovered some awesome Listening Center Response Forms free for the printing (Thanks, Michelle!). I like these a lot better than the forms I had been using, & have been acclimating my students to the new response forms. SO-- I'm hosting a LINKY PARTY! Show me what you've got! How is your center arranged physically in your room? How do you use it or implement it within your day?? Here is a picture of mine: I got the little sofas from Scholastic with my bonus points. LOVE them! And the kids love them too! I like the set-up this year. The CD player is on the flat file behind the sofas. I had a wonderful parent who made the red shelf for us last year which we keep between the two sofas and store the headphones, books, listening response forms, & pencils. As far as management..... groups visit the listening center once per week, so I only need to trade out the stories at the end of the week. I finally hit upon having the kids completely unplug their headphones this year. I'm not real happy with the way they look when not in use, but it SO helps with avoiding that spaghetti mess of cords! Now it's your turn! Show us your listening center & share your management ideas! Looking forward to seeing the new ideas! OMG... your listening center looks amazing!!! How many bonus points did you have to save up in order to buy those sofas?? I need to start hitting the yard sales pronto! I can't wait to join! 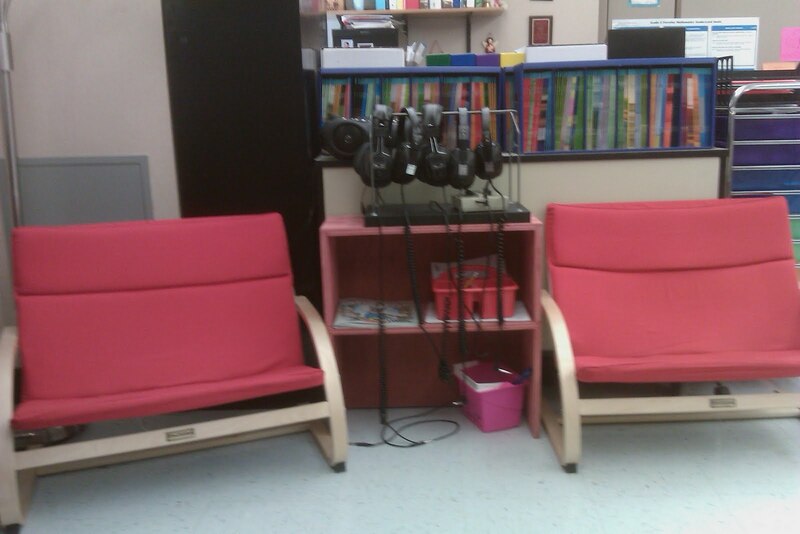 I am putting back my classroom but will take pictures of my "improved" listening area. Yeah!! I can't wait to join. I will take pictures tomorrow. Your room looks huge! It is awesome. Thanks! Can't wait to see everyone's ideas! @Jena- It's not really that big...just the angle of the picture. It seems like I am always on the mission to do something in my room to make it look bigger! Thanks for letting me know about my link Brenda. However, I have no idea how to get rid of the first one. SORRY!!! Great set-up. Love the sofas! Are the sofas from Scholastic? Do you think they'd hold a 4thgrader? I have enough bonus points, but wasn't sure about the size and weight restrictions. They are from Scholastic! Each seat would probably hold 1 4th grader. They can get pretty tight for my second graders (sitting in a pair) by the end of the year. The weight restriction is 180 pounds. I'm searching the Scholastic Site and can't find the sofas. : ( Do they have a brand name on the front?